Many women and some men often find it difficult to be able to find time to style themselves properly especially if they are traveling or constantly on the go. I will reluctantly admit I have found the older I get the more challenging this becomes. Packing options can be limited and so is your time, so I came up with some tricks and tips you can use to help maximize your wardrobe on the go! One of the most important considerations when traveling is be sure to pack outfits you can easily mix and match for both professional and personal occasions. Transitional looks that are well thought out ahead of time will help you stay in tune with your schedule and your outfit. Our Stella and Dot jewelry link on our home page have many options for transitional jewelry. Any jewelry marked with a “V” can be worn multiple ways. Matching your jewelry to those outfits while packing will help save you time later while dressing. By putting a few extra minutes of thought in to what you are packing can save you time and accomplish a flexible look now while still having more style options for later. Tip two will centers around location, location, location! Consider the locations and venues you are going to on your trip or during the course of your day. Are you going to a business lunch, beach, out with the girls or maybe a work happy hour with some colleagues? While preparing your style for the day consider transitional looks that can be worn from a professional setting into casual one. Day to night looks always help when attempting to pack light or when juggling multiple events in one day! Finally, accessorize for each event individually and bring a travel purse like the one below! 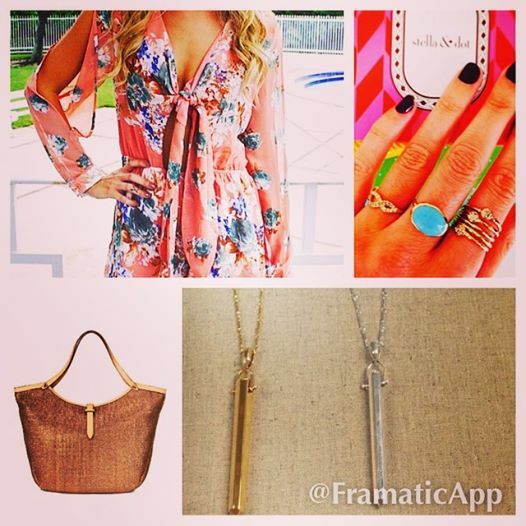 You can buy it from Stella & Dot (link available on home page). For a professional look be sure to wear jewelry that is timeless and chic such as studs or pearls. Save your dangly jewelry for a sassy night out with the girls. For your casual look choose more playful options. Add in your favorite new necklace or bangles and a couple of lengthy rings to match. In addition to being a girls best friend shoes are critical to customize and complete each look. Switching your heel from moderate to sky-high will help bring your look to the next level and get those heads turning in your direction! Get inspired and see examples by clicking my posts located on the homepage!!! Travel purse can be purchased by clicking: http://www.StellaDot.com Enter Nikk’s Traveling Fashion as your host for additional savings!